Lt. Gov. Brian Calley isn’t announcing yet what he’s doing next — and he’s also not closing the door on seeking the governor’s mansion again. The Advance also talked to Calley about Lame Duck and bills limiting incoming Democrats’ power. As perhaps the strongest lieutenant governor in Michigan history, Calley took the helm on many issues, including business tax reform and the Flint water crisis. But it’s an issue that hit close to home that Calley says made him proudest to work on: autism insurance reform. “That was so many years of failed efforts and finally getting it across the finish line, but it’s more than that. That policy was opposed by every business group, every union, and every insurance and industry interest group,” Calley said. It was when he first started to work on the issue while serving in the state House that he discovered his middle daughter, Reagan, now 12, had autism. “I wonder if you will ever know how many lives you improved just by being you,” Calley said in his farewell speech to the Senate on Dec. 21. Calley talked about all three of his children in that speech. He started with his oldest, Collin, 14, declaring, “I could not be any more proud of the man you are becoming.” And he noted his youngest, Karagan, now 8, had health problems as a baby. Calley also talked about his wife, state Rep. Julie Calley (R-Portland), who was just elected to a second term to the House seat he once held, following in the footsteps of both her great-grandfather, Herbert Powell, and her grandfather, Stanley Powell. “As the intensity of my life declines, I can’t help but suspect that the intensity of your life is about to go up as my shadow fades and people around find out what you can do when you’re not worried about how it impacts me,” Calley said in his speech. 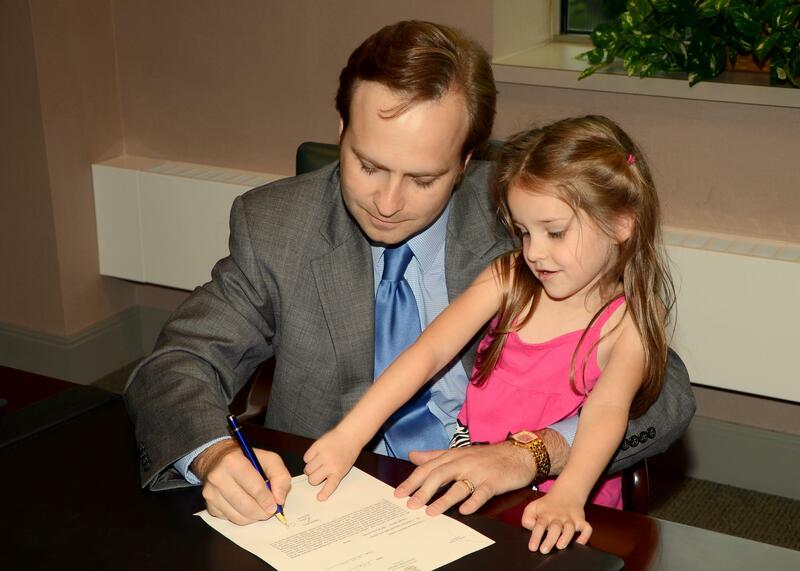 Calley, who was first elected to the House at age 29, has previously talked to this reporter about juggling his political career with his young family. In the interview last week, the LG candidly said that one upside to losing his gubernatorial primary is he’s no longer doing political events at night — which means more time with his family. “I’m making it to band concerts and track meets and bowling and just all kinds of stuff with the kids,” Calley said. In a previous story from the interview, Calley said he believes President Trump cost him the 2018 GOP nomination, but he would have been a stronger general election candidate than Attorney General Bill Schuette. And he discussed what kind of governor he believes Democrat Gretchen Whitmer will be. The Michigan Advance also talked to Calley about Flint, his relationship with Gov. Rick Snyder and his advice for Lt. Gov.-elect Garlin Gilchrist. That will be in a final story that will run on a future edition. Michigan Advance: What do you plan to do for your next career? Michigan Advance: Will it be outside a public sector? Calley: I do want to keep my foot in the door. I want to step back from politics, but I don’t want to be completely absent from public policy work. So I’m gonna try real hard to have my cake and eat it too. Michigan Advance: When do you expect that you will be public with what you’re doing? Calley: Shortly after the first of the year. Yeah, I don’t plan on taking any real time off. I don’t do well with time off. Michigan Advance: Will you be doing carpool more? Calley: Yeah, I expect I will be, and although, I do it quite a bit now. That’s one of the things that has been really awesome since the fall, is that while I’m still here working all the time, I’m not doing as many evening events and so on. I’m making it to band concerts and track meets and bowling and just all kinds of stuff with the kids. Michigan Advance: Do you have any interest in running for governor again, or for any kind of public office? Calley: I wouldn’t rule it out. Governor’s really the only office that is interesting to me. Going to Washington holds zero appeal to me. I love the work. It’s the scope of things that you can impact in a governor’s office [that] is absolutely extraordinary, just breathtaking in many ways. And so I love it, even though, politically speaking, it seems like a good time for me to take a step or two back from it, I will miss it a lot. Michigan Advance: Currently, there have been a number of bills that are floating around the Capitol that would seem to curb the powers of incoming statewide officials. How would you have felt if some of those bills were passed before you and Rick Snyder were going to be in sworn into office? Calley: Yeah, and I wouldn’t necessarily put every bill in the same category. I know they kind of get treated that way. And I really don’t mean to dodge this question, because he [Snyder] hasn’t announced his intentions or feelings towards them, anything that I say carries with it kind of ramifications. So … what I would say is, I don’t expect him to evaluate those bills any differently than he’s evaluated bills the whole time. And so he’s got a process that he goes through, and I think he’ll be true to it to the very end. Michigan Advance: What are you most proud of during the last eight years here? Calley: I guess I’d put that on a couple of different categories. My, by far, my favorite issue was autism insurance reform. That was so many years of failed efforts and finally getting it across the finish line, but it’s more than that. That policy was opposed by every business group, every union, and every insurance and industry interest group. Michigan Advance: It was called ‘Calleycare,’ I remember. And a lot of them. It was really the first time I ever saw an issue move through against the objections of the giants on both sides of the aisle and still make it. I had the full force and credit support of the governor behind it — that counts for a lot. I don’t want to underestimate that. So there was some institutional power behind it, but there are a million ways to kill a bill, and the way that this amateur group of lobbyists came together to descend on this system and just make it respond is still my favorite moment. Michigan Advance: It’s not September. Calley: Yeah, exactly. But think how much higher the bar is. Before, if now, if a budget not getting passed until late June is considered late, that’s a pretty awesome change. Michigan Advance: I know it’s early, but do you think that Donald Trump will win Michigan again? Calley: Yeah, it is early. It’s so hard to predict things here in Michigan. It was a really, really close election last time. I do think that he does have a very large audience here for many of his issues, his policies. So, I certainly wouldn’t count him out.I suspect that he’ll have a stronger challenger this time than he had last time. Michigan Advance: You mean from the Democrats, or … ? Calley: From the Democrats, yeah. Michigan Advance: Do you expect your friend, [Ohio Gov.] John Kasich, might run against him? Calley: I don’t know. I haven’t talked to Gov. Kasich since he was in the presidential race. So I don’t have any idea on that, but it’s hard to imagine the Democrats putting up a weaker candidate than they did last time.